From the archives because, Summer! I could give many reasons to repost this gorgeous post form last year, and I will :). It’s Summer, I’ve been out of town, came home to a Summer cold, had a huge tv appearance that took all of my ‘getting over Summer cold’ energy, and we’re getting ready to go out of town again. I think the last week since I got home, I have made a huge pot of chicken soup and that’s about it. It’s been a buy pho, eat chicken homemade soup, and rest kind of time. Re-energizing is on the books. 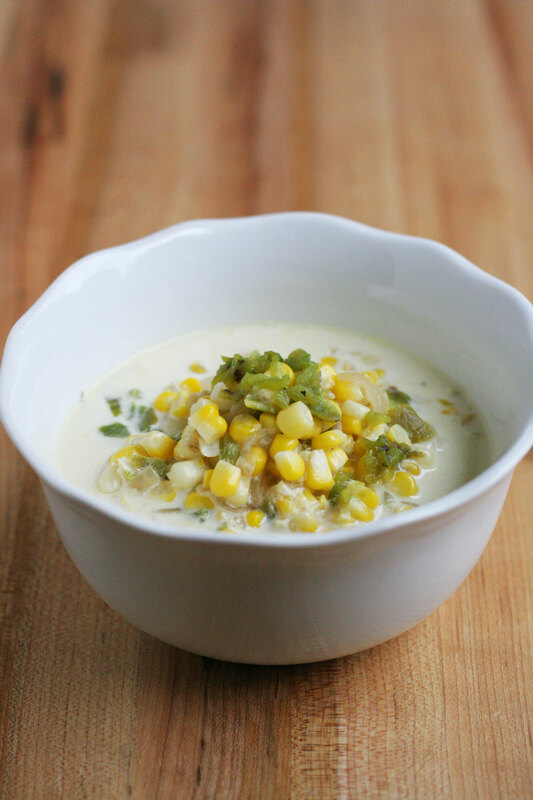 It’s also corn and hatch chile time, so I am making this today! More soup for our healing selves, and the light spice in these chiles is just what we need to boot the cold for good! As you can see from the title I am still in Summer mode and will be until the the last drop. Hatch chiles, corn, peaches, and all the glory of Summer is still here. Maybe it’s because I don’t have kids that go off to school, or something like that, that makes me feel like Summer is still here. That said, I made soup, totally opposite of what Summer is, but corn is all Summer. I totally had to make a chowda, and spicing it up with the happy Hatch Chile is where it’s at for this time of year. It’s not that hot here, although it will be later this week and weekend. You could make this in a crock pot if it is too hot to cook on the stove top, or even save this recipe for later when it gets cooler, and freeze up some fresh corn and chiles. Which is super easy to do! I am a heat eating kinda girl, and I love love love green chiles! I only added 1/4 cup in this recipe, but you could totally amp it up by doubling the amount, but maybe taste the chiles first. They vary in spiciness and blow your head off, or just tickle your tongue. Because that’s what chiles do! This is so good with more corn, like sweet cornbread, homemade corn tortillas, or flat bread! Notes: I grilled the corn and Hatch chiles over medium high heat for 15 minutes, turning frequently. 1. In a medium pot or dutch oven, add the olive oil over medium low heat. Add the onions and cook for 5 minutes, stirring frequently. Add the garlic, cook for 3 minutes, or until fragrant. Add water, corn cob, thyme sprig, bay leaf, and 1 teaspoon fine sea salt, stir to combine. Cook uncovered for 3o minutes to make the stock. 2. Add cream, cook on low heat for 5 minutes. 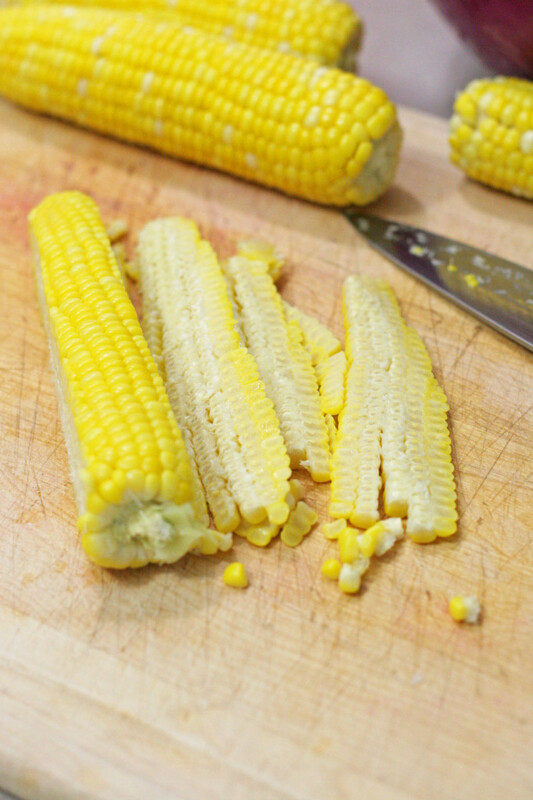 Add corn kernels, and 1/4 cup chopped Hatch chiles, stir weel to combine. Taste for heat from chiles, adjust by adding 1 teaspoon chopped chiles to increase heat. Taste to adjust seasoning, add fine sea salt and fresh ground pepper. Cook for 10 minutes uncovered. Serve warm, or store in an airtight container for up to 5 days. Add chicken, or sausage for extra protein. I hope you’re feeling better! This chowder looks perfect! I stocked up on corn just for the purpose of making some. Now to find hatch chiles. 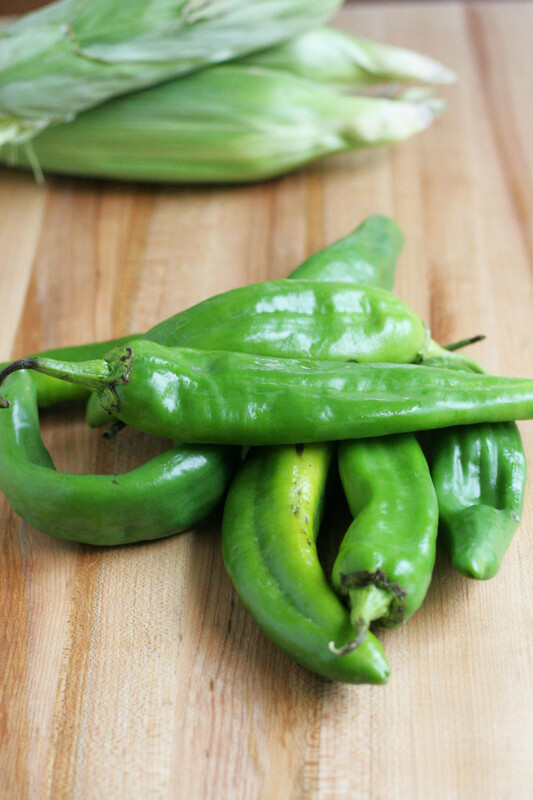 Hatch chiles are a wonderful addition to corn chowder, and this time of the year, I just can’t get enough of hatch chiles 🙂 YUM! 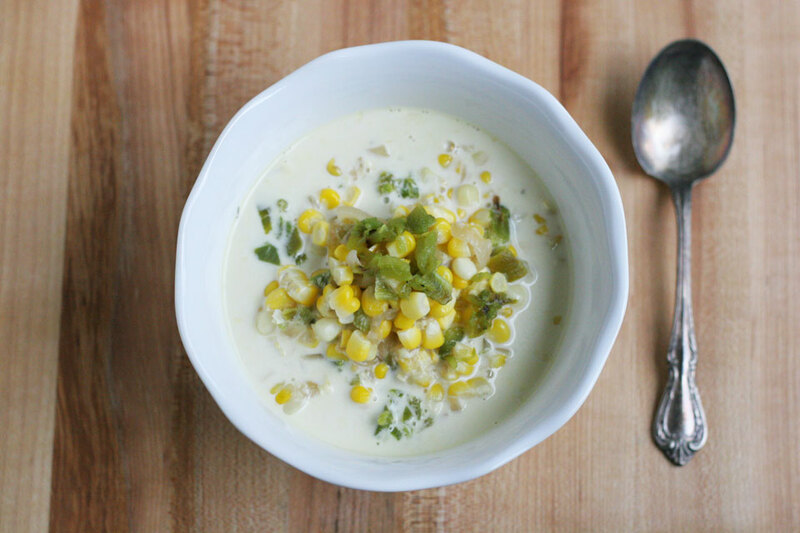 I looooove corn chowder and this looks fabulous, yummy! such an easy, yet delicious looking recipe! I love hatch chiles! I love a good corn chowder and your addition of chiles sounds great! This looks so yummy! 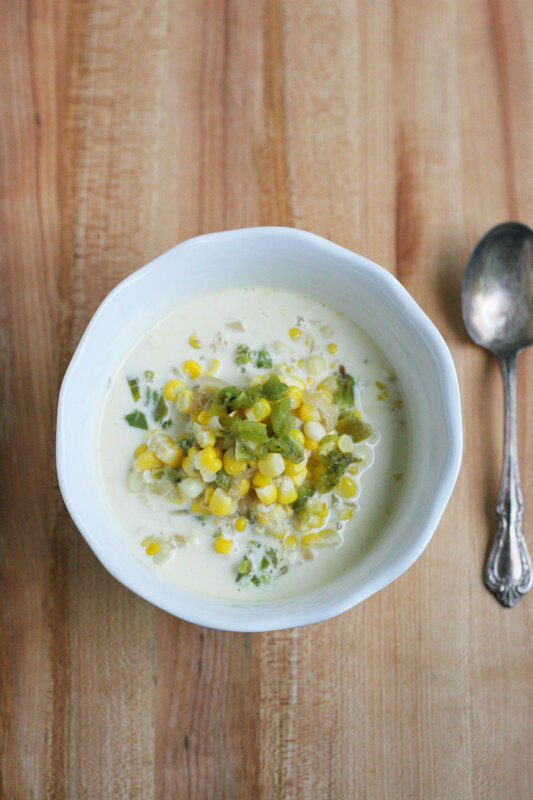 I love corn chowder and the addition of hatch chiles here is perfect. Hey, it’s still summer for most of the month, and I for one plan to eat like it! And like it’s fall, too, of course. And winter. I’m just going to eat a lot, is what I’m saying. 🙂 This chowder sounds wonderful! Love the chile and corn combination. Dude, I am right there with you all the way. I am eating peaches all month, berries, corn, chiles, and then I’ll get started on Fall. Thank you! Looks delicious! I’ve been craving a chowdah! That looks amazing. Especially the 2 cups of cream!!! It’s 90 degrees in DC, so definitely still summer. I WANT FALL!! !